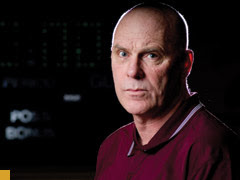 If you have followed Coach Don Meyer the past year, he has not doubt been a great inspiration to us all. But it is important to understand that as he navigates through the adversity that even in pain he is trying to teach us coaches. It is what he does best -- help us to do our jobs better. That's why one message he was sending us over and over resonated with me very strongly -- give thanks we have a team. If you watched any of his interviews, the part that was most emotional for Coach Meyer was talking about having a team to coach -- to teach -- to mold. During a video of his story showed during the ESPYs, the poignant moment of the night was when his daughter Brittany spoke of the first communicative message from Coach after the car accident. Unable to speak, he grabbed a pen and pad and wrote, "How long before I can coach?" In other words, "when can I rejoin my team!" Not too long ago I had career opportunity that would have kept me in athletics but took me away from coaching. As I do before making a big decision, I have a small circle of influence that I ask for advice and guidance which by the way always includes Coach Meyer. At the top of that list is my junior high coach and mentor, Allen Osborne. Allen listened to me explain everything and then told me to pass on it and stay in coaching. I asked him why and he responded, "You will miss the feeling of being part of a team. You will miss shaping a team. There is something special about a team." His words carried a lot of weight because a few years before, after long and successful career, Allen had retired. It lasted on year. He need a team again. To me the best part of being a coach is practice. It's what I enjoy the most. It's where I think I have the most influence on our "team." The way we conduct practices at LSU, in my opinion, not only makes them better players but better people. When asked what he misses most about coaching, John Wooden simply said, "Practice. The smell of the gym. The sound of sneakers squeaking." This really hit home even more last night when I was reading "Champion," a magazine published by the NCAA. Don Ketchum wrote an article in this summer's edition on Bruce Snyder. 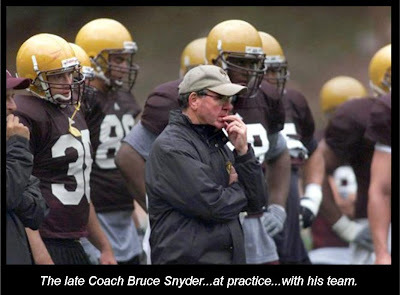 Coach Snyder was an outstanding football coach that died last spring after a courageous 10-month battle with cancer. "I was treated first class," he wrote. "Golf cart, access to the entire field, introduction to Coach Brown's staff individually and was able to watch the entire practice." "At one point, I closed my eyes and took in the feeling of being at practice. There was the smell of cut grass, the voices of coaches on the run yelling instructions, the sound of the horn to alert players and coaches to switch drills and the sounds of pads -- it took me back to the days that I cherish." "And at the end of practice, Coach Brown introduced me to his team and asked if I would say a few words. What an honor. I love talking to a team. It wasn't my team, but it was a football team." Sometimes we take things for granted -- like we in fact do have a team...our team! Sure, we have our share of adversity and obstacles but that's life -- and we still have our team! It also reminds of something that I heard Kelvin Sampson speak about three springs ago at a coaching clinic. He said his program would look each year for a retired coach to adopt because of the enormous hole in your soul when you get out of coaching. They would invite the coach to practices. Ask him for input. Have him address their team. Take him on a road trip. What an amazing idea. Mack Brown gave Coach Snyder a wonderful gift by making him a part of the Longhorn football program for an afternoon. So today, let's be thankful that we have a team...a team to practice...a team to coach. And let's think about those who no longer do and make them a part of our team! If you have the time, please copy and paste and email this to every coach you know. It's really an important message for all coaches to understand. 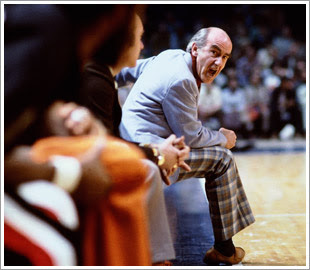 Navigate to http://www.coachmeyer.com/ and you can click on "Coach's Corner" and get some tremendous information on coaching including this list from Jack Ramsay. 11. Players draw confidence from a poised, alert coach who anticipates changing in game conditions. "The longer I live, the more I realize the impact of attitude on life. Attitude, to me, is more important than facts. It is more important than the past, than education, than money, then circumstances, than failures, than successes, than what other people think, say, or do. It is more important than appearance, giftedness, or skill. It will make or break a company, a church, a home. The remarkable thing is we have a choice every day regarding the attitude we will embrace for that day. We cannot change our past. We cannot change the fact that people will act in a certain way. We cannot change the inevitable. The only thing we can do is play on the one string we have, and that is our attitude. I am convinced that life is 10% what happens to me and 90% how I react to it. And so it is with you. We are in charge of our attitudes." With all the talk of vision, there needs to be execution. If you want 2009 to be your best year ever, then you, as the leader, must make sure you execute and that your followers and employees do, as well. Vision without execution is a pipe dream at best and a broken promise at worst. A few years back, Fortune magazine did an article, "Why CEOs Fail." The conclusion was that vision was not the culprit. What with all the vision-casting weekends and the endless time spent on vision statements and the like, companies certainly have enough vision. What they lack is execution. So what does it take to execute? I think there are five things that play a role in whether or not you as an individual and as a leader in your organization actually get stuff done this year. They all go hand in hand, and each is important to getting the job done. The Big Idea. This is the vision part, and it's where we start. This is the habit that Stephen Covey called "Begin with the end in mind." What is it you want to accomplish? Your idea should be big. It should be inspiring and generate enthusiasm. A small idea won't move anyone anywhere, and you won't get anything done as a small-minded leader. What is your big idea for 2009? Strategy. In other words, how are you going to get there? Your strategy is your plan. It is how you will get the job done. It is one thing to say you want to double revenue—who doesn't? It is another to develop a plan and strategy to do so. What is your strategy for achieving your vision in 2009? Consistent, Effective Communication. Once you have your vision and you have your strategy for achieving your vision, you have to drive them through your organization to every level so everyone knows the vision and the strategy. Without consistent and effective communication, your vision and strategy are worthless. They will just be framed statements that hang in the boardroom and grace the cover of your annual report. Most leaders under-communicate by a huge factor. What I have found is that leaders say something a few times and they think everyone must get it, so they stop saying it. What they don't realize is that the followers don't get it after a few times. We live in a very complex world with way too much communication, and our message gets lost in all that garble. Unless you are the one in a thousand, let me tell you: You are under-communicating your vision and strategy. You need to keep saying it and saying it and saying it. And when you are done saying it, say it some more. Say it in person, say it on the phone, say it in e-mail, say it on video, say it at your meetings and say it on your conference calls. Got it? Say it! Take Action. The next important step: You must take action. Your employees and followers must take action. Knowing what to do and not doing it is one of the travesties of the human condition. It is as old as humanity itself. One ancient writer said "The things I want to do, I do not do." We all can relate to that! When it all boils down, you are left with some who act and some who don't. What separates the successful leader from the unsuccessful leader? Why is it that some succeed and others fail? There have been thousands of books written and seminars given to answer that question, but when it comes down to it, there are some who take action and execute and some who don't. Those who do, succeed. Review Regularly. I have a friend who is always saying, "Plan, do, review," and "Inspect what you expect." He is one of the sharpest business people I know and his businesses thrive. He regularly goes back both by himself and with his employees and reviews where they are and where they are going. He holds himself and his employees accountable to the vision they have and the actions they are taking to get there. 1. Develop your compelling and inspiring vision. 2. Create your well-thought-out plan and strategy. 3. Communicate that vision and strategy consistently and effectively. 4. Take daily action on your strategic plan and make sure your followers do likewise. 5. Review your vision, strategy, communication and actions regularly. In a nutshell, that is execution. It isn't rocket science. Actually, it is relatively simple. Yet it is very often the simple stuff that trips us up. Execution is simple. It is hard, but it is simple. postpone, and one which we intend to win, and the others, too." "Well, more than anything else today, it's the fact that at the place where I have breakfast almost every morning, one of my ex-players will show up. Mike Warren, Keith (Jamaal) Wilkes; Bill Walton drives up from San Diego, and that's nice. I love my memories about the time that I taught these players. I think about it. And I like the game now, but I don't like the game as much. I have never cared for the showmanship, and I think there is too much showmanship in the game today. While I think the players today are just unbelievable — their athleticism — I don't think team play is as good as it used to be." 1. A well-defined organizational structure with a distinct delineation of responsibility must be established. 2. The purpose of that structure must be equally well-defined and documented. In other words, we need to know — and put it in writing —what each person is doing and who and when it is to be done. More maxims on organization from Walsh and they can help us. An organizational structure should be designed in such a way that the strengths of the organization’s employees are maximized and their weaknesses made irrelevant. The structure of an organization must have the flexibility and adaptability to meet unexpected obstacles, crises or developments. Crisis management requires anticipation, preparation, and practice as well as a cool-headed troubleshooting team. A plan for structuring an organization should be put in writing to provide a documented source of reference and guidance for everyone involved. In the face of massive (and often conflicting) pressure, an organization has to be resolute in its vision of the future and how it plans to get where it wants to go. 1. “You internalize anyone who is significant to you, past and present. As well, the people you are leading are currently internalizing you. As a leader, you have the responsibility of knowing that people are storing mental and emotional pictures of how you relate to and lead them.” These are our relational images. It reminds me of a quote from Shakespeare, “There is a history in all men's lives.” This includes you too. We relate to others in ways that others have related to us. This of course has an impact on the connections we can make with others. 2. Develop good and healthy relational images. “Take in the good and forgive and grow from the bad.” He explains, “Some of your own significant relationships may have been with people who were cold, controlling, manipulative, self-centered, critical, or even abusive. This can create distorted or nonfunctioning pictures of how relationships should work.” Is your leadership drawing on images that don’t work for you? 4. “Relationship provides the bridge over which truth can be conveyed. In your leadership, your people will experience truth in the absence of relationship as harness, judgment, or condemnation. They will resist it and refuse it, either actively or subtly. Truth is hard to swallow if you don’t feel connected with the truth teller. That is why being “for” the other person, letting them know that, and being as emotionally accessible as possible, at the time of the reality, is critical.” Often “counseling” or performance appraisals often derail on this issue as no sense of being “for” the other person has been established. Trying to develop a relationship “at the time of the reality” is too late. Do it now. IF YOU'RE SUPPOSE TO WIN, WIN! 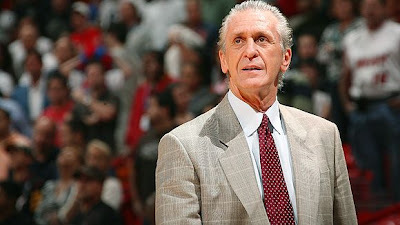 Some thoughts from Pat Riley in Charlie Jones' book, "What Makes Winners Win." "If your goal is to have the best record in the league, and you’re talented enough to have the best record in the league, then there’s never an excuse to lose to a team that is not as good as you are, regardless of the conditions." "I never believed in the theory that on any given night, anybody could beat you. I don’t believe in that. 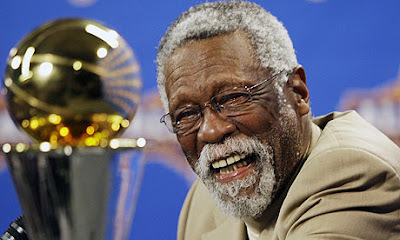 I mean if you’re better than the Spurs or the Nuggets or the Los Angeles Clippers, then you should beat them." "The way you get to be really great in this league is to defeat the teams that you’re supposed to defeat, and there are never any excuses about that." "We work on that all the time and talk about it. I don’t care if we’re tired. I don’t care if this is the third game in four nights, we’re playing a team that we’re better than. If we have this goal in mind, establishing our position to get the best edge in the playoffs, then we’re going to win. Very rarely did we ever lose those games." As a coach, I'm an early riser. For instance I got into the office at 5:30 AM this morning. Knocked out my "Thought for the Day" on Twitter and Facebook then went and got my exercise routine in. It's now 6:30 AM and time for a blog entry. Getting up early always gives me a great head start on the day. It's a wonderful time to get some key things on my desk completed in the quiet of the office before visitors drop in and phones start ringing. I always feel better about myself when I start the day early. One of my favorite quotes that I keep in a card the front of my Frankling Covey Planner reads: "The heights by great men reached and kept, were not obtained by sudden flight. But they, while their companions slept, were toiling upward in the night." We work our team out early quite a bit. The weight lifting in the summer for them is available at 6 AM. When school starts we condition at 6 AM. There are a lot of reasons for the early morning workouts but I think it builds character to rise before the sun does. It's a life lesson they can call on for the rest of their lives. I love it when players talk about how difficult it was getting up for 6 AM workouts and now that they are playing professional basketball they do their off-season workouts in the morning. 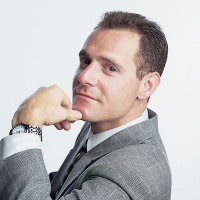 For a man who’s so successful, Brett Yormark spends a lot of time in the dark – literally. His rock-hard work ethic is paying off. When Yormark joined the Nets four years ago, it was an underperforming franchise, but through a relentless flurry of creative marketing ideas, including initiatives offered by no other team in the NBA, the tide has turned. The Nets are one of only a handful of teams that have sold 2,000 new, full-season sponsorships three years in a row, and sponsorships have increased by more than 200 percent, even after the controversial decision to move the franchise to Brooklyn. Yormark, in fact, is a master at using the celebrity power of his players to pull in sponsors and ticket holders. He debuted the Nets Ticket Influencer Program, in which the team hosts cocktail parties for prospective season-ticket buyers at the homes of season-ticket holders. Staff and players, including such stars as Vince Carter, mingle with the prospects and talk up Nets basketball. The team provides the star power – along with food and drink – and the host provides the prospects. It’s a trendsetting tactic in reaching consumers and probably one of the reasons Yormark has been called “the man who NASCAR-ized the Nets.” The Nets have held more than 100 Influencer events, and they average $75,000 in ticket sales. Another successful initiative has been the Home Away from Home Program, in which the Nets invite prospective season0ticket buyers to have dinner and watch a road game on the 65-inch TV in coach Lawrence Frank’s screening room. Either Darryl Dawkins or Albert King, both retired pro-basketball players, attend the viewing party and break down the game for the guests. Yormark has found several ways to appeal to cash-strapped potential ticket holders. The $199 Season Ticket Program (which breaks down to less than $5 per game) was first introduced in August 2006, and the 500 seats sold out in a little more than 24 hours. In the past two years, the Nets have offered $299 Season Ticket Programs with similar success. During the Broadway stagehands’ strike in early 2008, stranded theatergoers were invited to turn in their unused Broadway tickets for a 50 percent discount on select Nets tickets. Even the smallest gesture, Yormark believes, shows customers that the Nets care. On Fan Appreciation Night, tolls off the New Jersey Turn-pike at the stadium’s exit were paid for one hour by the team. “When times are tough, it’s easy to turn down the volume and do what’s safe,” Yormark says. “But leaders are the ones who turn the volume up. A manager needs to understand how to take calculated risks. He needs to have the stomach to look at hard times and say, ‘This is out chance to grow this thing.’”. “You’re not just as strong as your last play. You’re as strong as your strongest relationship” says Yormark. Interesting to hear Coach K address team before first USA practice. You can already hear what he is stressing by the stories he tells. He wants people to accept roles and be ready to defend. I am spending the day working on our team notebooks and looking for some motivational quotes to splash throughout the the notebook and here are a few I'm going to use. Visit any home improvement store on a Saturday morning, and you will see the beginning of hundreds of projects. People gather supplies, get instruction, and consult with professionals to get their game plans in order. Week after week the same scenario plays out. Based on sales, it would appear that these weekend warriors will soon beautify and improve the entire planet. But reality and results tell another story entirely. A quick look through the garages and basements of many of these great starters would likely reveal the truth about completion: the final ten percent, for many people, is virtually uncharted territory - meaning they never get there. Carry the accumulation of half-demolished foyers, clogged caulk guns, and piles of debris into the business world, and it's no different. The pattern for success in business is to recognize an unsatisfied need, innovate to find and provide a solution, then to expand and repeat the process. Somewhere between innovation and delivery, we find the no-man's zone known as completion. I once employed someone who proved to be an excellent initiator but a terrible finisher. She would start a task but get hung up once she encountered an obstacle. When asked why she didn't get the job done, she blamed someone for not getting back to her or a situation she'd encountered. In short, she didn't understand how to drive to completion. What makes completion such a challenge? Completion forces us to step forward. For many people, the thought of completing a goal is unsettling - even when the task at hand is unpleasant. Maybe it's the sense of the 'known evil' being preferable to the unknown one. No matter how ornery a project has become, at least it's a pain in the neck that is familiar. We know that upon completion, we must choose again. We question whether we've got the goods needed to accomplish the next challenge. Completion forces us to step up. Concluding the current initiative inevitably moves us to a point of "what next?" For success-minded people, the answer to that question always comes in the form of raising the bar. Knowing that an even greater challenge lies ahead can make incompletion insidiously alluring. We know that each completion is followed by a call for even more. We wonder how we will bear up as the stakes are raised. Completion forces us to step out. Whether the task at hand is pleasant or not, we become attached to it. No matter how hard it seemed as we first put our hands to the plow, it is now within our comfort zone. It is familiar, and it seems manageable. People generally fear change. We convince ourselves that survival depends on staying inside our circle of competency. Completion represents a not-so-subtle nudge out of that circle. For many people, incompletion has become a way of life. It takes the form of procrastination, loss of interest, confusion, and frustration. By remaining at the 90% complete mark, we reap the dubious benefits of security, mediocrity, and familiarity. How can we push forward for completion? Focus on one task at a time until it is complete. This sounds like an effective solution - on paper. Chances are, though, that your world is more complex than that. However, even with multiple projects and priorities going on at the same time, you can still focus on one idea at a time and then move on. Each new opportunity should be evaluated before you commit. Remember that 'good' is the enemy of 'best' in your consideration. Does it serve your purpose? If so, engage and then move forward into completion. Understand the price you pay for incompletion. The process of beginning an initiative and working on it requires that you fully engage your commitment, your creative power, and your attention. The deepest recesses of your mind loathe letting go of these commitments. Like an elbow constantly poking into your ribs, your mind will nag you unceasingly about your incompletion. This distraction is often enough to pull you right out of the game when it's time to take your next step. Enjoy the rewards of completion. The marketplace rewards completion. Every purchase of goods or services is immediately and unconsciously evaluated for completion. If you were to go out for dinner, place your order, and then never receive your food, you would complain, refuse to pay, and never want to go there again. If you purchased a car and discovered it was missing some key component, a steering wheel for example, you would refuse to take delivery. It's been said that the key to outrageous success is to do what nobody else will do. This brings to the forefront an opportunity to excel through completion, and reap the rewards of your diligence. A quick look around illustrates people's tendency toward procrastination, loss of momentum, distraction, and incompletion. By committing to completion, you will do what nobody else will do, and the rewards will follow. Recognizing the prices and benefits of completion may be enough to move you forward. What prize awaits when you push forward for completion? "A word more about the game I have known so well. One time in Los Angeles during the lockout, I was talking with Shaquille O'Neal, someone I have great respect for as a player and as a person. We got into a conversation about foul shooting. His critics never let him forget how much he hurts his team by not making free throws. I told him by all means to keep working on the craft of foul shooting, but to always keep the focus on what he was doing overall to help his team win games. If he got sidetracked worrying about shooting fouls, it would only undermine what he did best. Shaq is a player who offers far more to his team than his ability, or lack of ability, to convert free throws. He has a complete game to offer. He is a mammoth presence in the middle of the paint. No one can stop him from scoring. If his opposition fouls him again and again, he has the strength to break that strategy eventually. He is a much better passer than people give him credit for. His game is full of possibilities, and all he really needs to remember is to use all of himself and not let himself get sidetracked. The Lakers won a championship in 2000, the first with Shaq in the middle, not because of his foul shooting, but because he found a way to use all his skills to help his team become a winner." 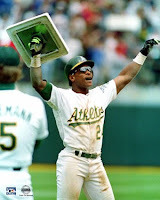 At the peak of his game, Rickey Henderson could overwhelm teams with his speed, surprise them with his power and unnerve them with his swagger. He also put front-office executives on edge with his contract-related rants and confounded beat reporters with his diction. Showman. Hot dog. Prima donna. Rickey being Rickey. We've heard them all at one time or another, in both first- and third-person variations. "Popular teammate" rarely appears in the Rickey's greatest hits lexicon, but the players, managers and coaches who've shared clubhouses with Henderson through the years paint a more layered portrayal than the one that's typically available for public consumption. Phillies outfielder Raul Ibanez saw the phenomenon nine years ago in Seattle. In 2000, Ibanez was a part-time player trying to gain a foothold with the Mariners at age 28. He spent a big chunk of the season as Henderson's backup, late-inning defensive replacement and all-around caddy. As the summer progressed, Ibanez came to appreciate an act of generosity by Henderson that went unnoticed by everyone else. More than once upon leaving the game in the seventh or eighth inning, Henderson went to manager Lou Piniella and yielded his final plate appearance of the day to Ibanez. "Whenever Lou would put me in to give him a [rest] or play defense, Rickey would say, 'Let him get the at-bat,'" Ibanez said. "That was unbelievable. 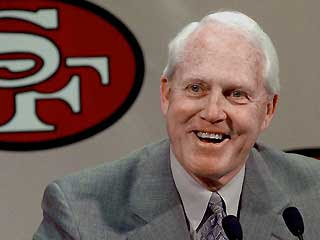 He was a Hall of Famer and I was a young guy coming up, and he treated me like an equal. I loved Rickey Henderson." 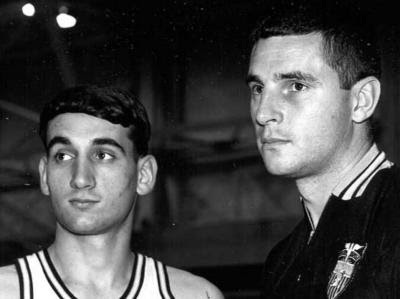 And they are also contemplating this question: Knight or Krzyzewski, whom would you hire? While the deck seems stacked in favor of Coach K, at least under today's standards of behavior, some interesting perspectives come forth in the classroom. The class learns that many of Knight's former players love the man like a father, and that students demonstrated en masse at Indiana when Knight was fired. When asked how Knight and Krzyzewski are alike, students say that both are passionate, disciplined, technically competent, and deeply care for their players beyond the basketball court. "Effective teamwork begins and ends with communication." "Making shots counts, but not as much as the people who make them." "A common mistake among those who work in sport is spending a disproportional amount of time on "x's and o's" as compared to time spent learning about people." "Leaders show respect for people by giving them time." "A leader has to be positive about all things that happen to his team. Look at nothing in the past as failure." "Leaders have to give time for relationships. But more demands will be placed on their time as they become more successful. So if a person’s success is based on developing relationships, then they have to continually find new ways of getting it done." "Every leader needs to remember that a healthy respect for authority takes time to develop. It’s like building trust. You don’t instantly have trust, it has to be earned." "During the season, your team should be led with exuberance and excitement. You should live the journey. You should live it right. You should live it together. You should live it shared. You should try to make one another better. You should get on one another if somebody’s not doing their part. You should hug one another when they are. You should be disappointed in a loss and exhilarated in a win. It’s all about the journey." People want a recipe; they want a formula for how to build a team that we\ill serve it’s intended purpose. Recipes guarantee that if you follow these steps in this order, you will get a favorable outcome. But team building is not about a recipe, it’s about taking the necessary time to build this team for this purpose. Many have said that I coached the Olympic team differently than I coach my Duke teams. Of course I did. If I’m doing my job right, I also coached my Duke teams differently each season. Your team-building plan must be personalized and specific to your personnel, your competition, your goal, and your leadership style. The time you spend as a team is defined by moments: moments that unite, create understand, and allow you to discover your collective identity. These moments make you one, make you better, make you proud. Some moments are planned. You know they need to happen so you design them. But there are other moments that happen on their own, a natural by-product of team formation. Still other moments pass by unnoticed until you discover their importance later on. You come to realize what they really meant and how critical they actually were. How do you build a team: Embrace moments. Plan for moments. There are moments of anger, moments of joy, moments of togetherness, and sometimes just moments of awareness. Learn how to recognize them, facilitate them, reevaluate them, and most important, share them. They are the lifeblood of your team. I ask our players to give more of themselves than they think is possible. I know they have more inside of them. I know it. That's why I set such high standards for them physically. I want them to learn how to dig deeper. By doing things when you are too tired, by pushing yourself father than you thought you could -- like running the track after a two-hour practice -- you can become a competitor. Each time you go beyond your perceived limit, you become mentally stronger. From "Reach for the Summit"
Like most people, I never gave much thought to defining my personal philosophy, but I admit I was stubborn about what I believed to be right. 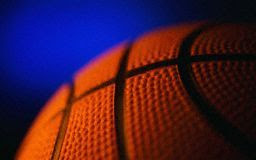 Basketball is beautiful game, and I had a vision of how it should be played and how our program should be run. That vision involved our coming together as a team, putting team ahead of self, first and foremost, and being smart and hardworking. We were tough on our freshman. We believed we had to take them out of the bad habits they had formed in high school, often with their coaches’ blessing. In ridding them of bad habits, we tore them down in order to building them up. The addition or subtraction of just one player can have an enormous impact on a team’s chemistry, not to mention its ability. We made adjustments each year, depending on our personnel, and an annual goal was to disguise our team’s weakness and accentuate its strengths. We didn’t fear change even in the midst of the season. When your goal is to put your players in the best position possible for them to be successful, there’s a time to be stubborn and a time to be flexible. Here's a great piece on being competitive from Ernie Woods and Bob Kloppenburg at Cybersportsusa.com. Their section, Hoop Tactics is as good as it gets. This is an example of something we will pass on to our players to read...hope you enjoy it. Real competitors are those players that come to play every time they step on the court. They are a team’s hardest workers constantly, improving. They are not the type that scream at their teammates or officials or kick trash cans after the game. They are the type that are determined and just plain enjoy playing. Competitors are those players that players love to play with not against, spectators love to watch, and coaches love to coach. Real competitors are hard to find. Legendary Coach, John Wooden, once said that “If you have one competitor on your squad you will be successful. If you have two you will be competing for the conference title and with three a national title.” He had no idea what four or five competitors on a single team would be like since he had never witness it. Real competitors view adversity as a challenge not as a detriment. In trying situations, they compete and work hard to over come it rather than get frustrated or angry. Michael Jordan is a classic example of a real competitor. He competed every night despite the fact that he was facing the opponent’s best defenders, double teams and even triple teams. Despite constantly being held and grabbed, pushed and shoved, he rarely ever complained to the officials or lost control of his actions. Instead he accepted the challenge and was more motivated to succeed. When Michael Jordan stepped on the court he was bound and determined to be successful no matter what the opponents threw at him. Real competitors make their teammates better. They are not successful at the expense of their teammates. They do not gripe or complain about the teammates’ lack of skills and abilities. But, are helpful not only in improving their teammates skills but more importantly their confidence. Did you know while playing for the Chicago Bulls, in order to make his teammates better, Michael Jordan scrimmaged with the second string during practices? After bad calls or turnovers, rather than griping or complaining, they hustle back on defense to make a defense stop. They are fully aware of the fact that the only turnovers that hurt a team are the ones upon which the opponent score. If/when the opponent does not score after a turnover then, no matter how bad, that turnover is erased! Competitors don’t have to look at the score board to know the score. Winning is certainly important, but how it is achieved is more important. To them the most satisfaction and pleasure comes in playing the game, not with the final game score. They know that when they are passing, shooting, rebounding and playing solid defense well, the scoreboard will take care of itself. They play every play in a game as if it was the last play of the game. After the game, regardless of the score, they are satisfied because they gave it their best effort. How do you identity competitors? A simple test for competitiveness is to place a player with the worst players and have them play against the best players. In this situation, do they except the challenge and give it their best in rallying their lesser skilled teammates into competing against the stronger team or do they complain, sulk and give a less than best effort because they are over matched and not playing with the stronger group? I subscribe to a lot of email services from motivational sources like Brian Tracy, Zig Ziglar, Nightingale-Contant and Seeds of Success. The follow passage comes from Seeds of Success from Successmagazine.com. The link to subscribe to the free email newsletter is below...but while you are there, check out the entire site -- lot of great stuff here! It’s easy to think about what is missing and ignore what you have. When you develop an attitude of gratitude, you begin to view things from that positive light and start working toward making something happen. Giving up is not an option you can entertain. When things go wrong, don’t go with them. As you look at yourself, you have to harness your will, you have to be grounded, you have to pause and you have to go within. Begin to clear your head and give yourself permission to accept the reality that is happening. And then turn the page and start working toward where you will go from there. Matt Jones, one of my speakers, wrote a book with the message: If you’re going through hell, don’t stop. Keep moving. Start with small steps and build from there. When you are not active and you’re not engaging in life, you have a tendency to worry and regret and to engage in less-than-useful emotions. It’s very important that you start moving and working and doing things that can give you some headway. The more active you are, the less chance you have of becoming depressed, angry and immobilized with fear. Many times, people fail because they can’t see the picture when they are in the frame. They think there is no way out. These are people who are disconnected and feel isolated and desperate. But interacting with others provides a number of benefits, including helping us find new paths and new ideas to explore. Don’t expect instant results. Plug away carefully and consistently, and keep the mindset that things are going to get better even though you can’t see the light at the end of the tunnel. We are living in a microwave society where we want instant results. But it’s not that kind of party. Patience and a spirit of expectation and trust will help you work to reach your goals and dreams. Great artcile by Creighton Burns on Winning Hoops (a great coaching resource site) discussing how to get the most out of your practices. I'm a big believer that practice is the singularly most important thing for molding your team and your program. The way you practice develops your players on and off the court and creates the culture that you want to represent your program. In this fashion, I think practice has a direct relation to improving you ability to recruit. We love for recruits to watch us practice because we think they can see the organzation, and the individual teaching and the ways we utilize to succeed at LSU. Here are just a few of Coach Burns pointers. • End practice on a positive note. Send them home happy. • Vary the drills to prevent monotony. Have different drills that teach the same skills, and use drills that have several different fundamental skills within the drill. • Make the drills competitive. • Start and end practice on time. • Do not run drills into the ground. Individual drills should be from 5 to 7 minutes in length and team drills should last no longer than 10 to 12 minutes. • Teach new concepts early in the practice session when the players are fresh mentally. • Make pass fakes and shot fakes a part of your drill situations. • Name the drills and make sure the players know the names of the drills. • Basketball is a game of quickly changing situations — demand that your players move quickly from drill to drill. • If you cannot get it done in two and a half hours, you are not going to get it done. • Shorten practice time as the season progresses. • Utilize the whole-part-whole method of teaching. • The gym is your classroom — make sure everyone treats it as such. • Run your practices the same way you coach in a game. • Stress attention to detail — strive for excellence and demand proper execution of the fundamentals. • Teachable moments occur naturally during the practice session. Always look for the teachable moment. • Run your drills full court. Transition is a huge part of the game. But back in 1954 more than 50 medical journals had published articles saying that the four-minute mile was not humanly possible. Doctors were warning athletes of the dire consequences to anyone who broke that “unbreakable” barrier. In the meantime, coaches all over the world, with stop-watches in hand, were encouraging their charges to do their best – but to forget about breaking the “impossible” four-minute barrier. Dr. Lynch says that the path to personal excellence is cluttered with obstacles. It is my own personal conviction that you can’t develop your full potential without encountering serious obstacles along the way. Dr. Lynch also says that you can’t stretch your limits without encountering some rough moments. You need to understand that failure and losses are acceptable learning experiences that can help improve your performance. This is true in every part of life, whether it involves athletics, academic achievement, business or sales success. It’s true that airplanes and kites rise fastest when they fly into the wind. Individuals grow stronger physically, mentally and spiritually when they are “tested” with resistance or opposition. Think about it and I’ll SEE YOU AT THE TOP! 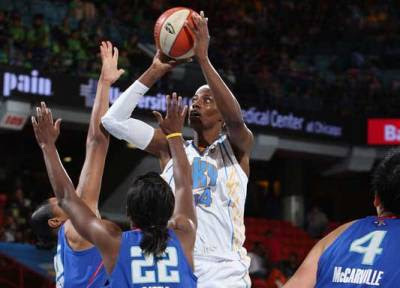 "Proud Papa Moment" today as Sylvia Fowles starts in her first WNBA All-Star game. Coach Don Meyer always speaks of "when your best player is your hardest worker then your team has a chance to succeed." 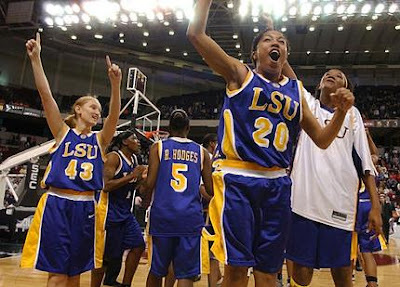 Well Syl was our best player and our hardest worked at LSU. She was also a phenomenal teammate. Result: 2 SEC Championships and 4 Final Fours. I will have some bittersweet feelings when the ball is tossed up this afternoon because Seimone Augustus will not playing in the All-Start game due to her ACL. When she was injured I think she was playing better than anyone in the league. Mone was another who was obviously a great player but possessed a tremendous work ethic -- still does and it will pay huge dividends for her during the painful and tedious process of rehabbing her knee. 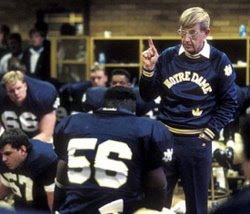 Lou Holtz did a great deal to influence his assistants. He was the only head coach I worked for who handed out a manual that detailed the polices and expectations for coaching, recruiting, player relationships and relationships with the university and the community. In the "practice" section, the first statement was, "DO NOT CURSE at the players or situation." If a coach used obscenities, Holtz would say, "It's time you look for another job." The manual had many other terrific thoughts for assistants to become exceptional coaches. Among them: "Strive to improve your coaching constantly. Strive to make your group the best on the field. Don't argue or discuss problems on the field with other coaches. Players must respect you to play hard. This can only be done if they have a feeling for you." Holtz also passed this humorous concept to the staff: "When you get an athlete, he's got to be motivated, and he's got to be committed. It's like the kamikaze pilot who flew 54 missions -- he was involved, but not committed." 1. Many will minimize you and your abillity to accomplish your dream. - During the NFL draft many critics said Emmitt was too slow to play in the NFL. 2. When you succeed, many will minimiaze your contributions by saying anyone in your situation could do it. 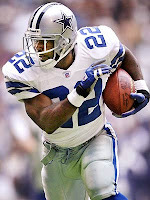 - Critics stated that many NFL backs could lead the NFL in rushing if the had the offensive line of the Dallas Cowboys. 3. You will learn to play hurt on the way to your dream. If you cannot play hurt, you cannot accomplish big dreams. - Emmitt separated his shoulder in a key game, but refused to go out because the season was on the line. 4. You will learn to refuse to read your own press clippings. - Emmitt never allowed his growing success to change who he was or his discipline to continue. 5. You will be blessed with great teammates to support you on your journey. - Emmitt has encouraging teammates who believed in his vision to break the record. 6. You will develop a sense of historic imagination to carry you through the daily grind. - Emmitt had studied the greatest backs and knew the magnitude of the historic quest that he was undertaking. 7. You will learn that many who start the journey with you will not finish it with you. - When Emmitt set the record, Troy Aikman and Michael Irvin were both retired. 8. You will learn that excellence requires excellence requires sacrifice, but it is worth the price. - Emmitt maintained a strict regimen of eating, exercising, and self-denial to accomplish excellence. COACHES, IF YOU READ ANOTHER BOOK THIS SUMMER, MAKE THIS ONE IT! John Maxwell's most recent book is amazing. 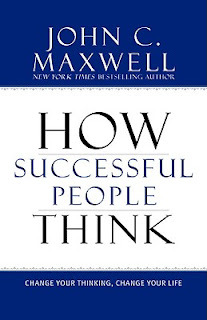 "How Successful People Think," is an instruction manual to improve our power of the mind and how can better utilize our brains. Below is just a small sample. How small? This came from the introduction and not the main chapters of the book. This is a great book for coaches to read. It is a small book with 124 pages of outstanding strategy for better thinking. It’s hard to overstate the value of changing your thinking. Good thinking can do many things for you: generate revenue, solve problems, and create opportunities. It can take you to a whole new level — personally and professionally. It really can change your life. 1. Changed Thinking Is Not Automatic. Sadly, a change in thinking doesn’t happen on its own. If you want to become a better thinking, you need to work at — and once you begin to become a better thinker, the good ideas keep coming. Good thinkers always prime the pump of ideas. They always look for things to get the thinking process started because what you put in always impacts what comes out. Read books, review trade magazines, listen to tapes, and spend time with good thinkers. Spend time with the right people. As I worked on this section and bounced my ideas off of some key people (so that my thoughts would be stretched), I realized something about myself. All of the people in my life whom I consider to be close friends or colleagues are thinkers. The writer of Proverbs observed that sharp people sharpen one another, just as iron sharpens iron. If you want to be a sharp thinker, be around sharp people. To become a good thinker, you must become intentional about the thinking process. Regularly put yourself in the right place to think, shape, stretch, and land your thoughts. Make it a priority. Remember, thinking is a discipline. To start the thinking process, you cannot rely on your feelings. If you wait until you feel like doing something, you will likely never accomplish it. The same is true for thinking. You cannot wait until you feel like thinking to do it. One good thought does not make a good life. The people who have one good thought and try to ride it for an entire career often end up unhappy or destitute. They are the one-hit wonders, the one-book authors, the one-message speakers, the one-time investors who spend their life struggling to project or promote their single idea. Success comes to those who have an entire mountain of gold that they continually mine, not those who find one nugget and try to live on it for fifty years. THE "PLODDERS" AND THE "SUPERSTARS"
ARE YOU "INTERESTED" OR "COMMITTED"